1. Suitable for PVC/PE extrusion line. 2. Electric wire & cable insulation, sheathing, stripping & skinning. 3. For single & two or three layers extrusion are available by using different extrusion head. Main composition: 1. Pay off stand. 2. 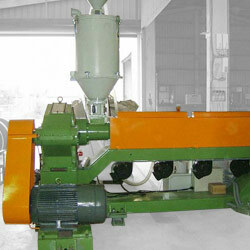 Extrusion equipment (Including wheel stand of stretching line, extrusion main body, extrusion head). 3. Water cooling trough (Including moving type and fixed type). 4. Dual wheel capstan / haul-off caperpillar. 5. Cable accumulator. 6. Take-up machine.